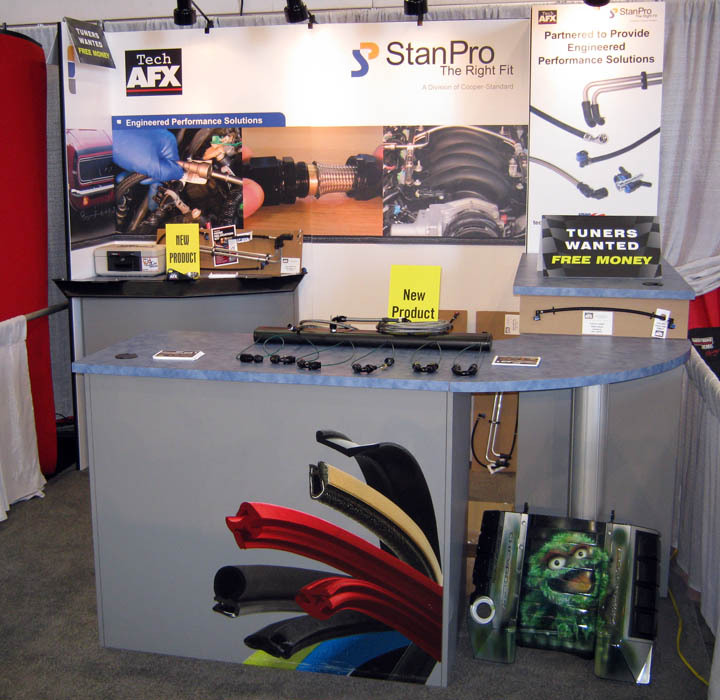 Make sure to stop by the TechAFX display (SEMA Booth #24791) to touch the future of performance hose assemblies. TechAFX, an aftermarket performance technology company focused on emerging market segments, will be showing their full line of OE-style Quick Disconnect (QD) fitting hose assemblies and home-assembly aluminum AN fittings for PTFE (PolyTetraFluoroEthylene…or Teflon) hoses. The TechAFX QD fitting hose assemblies are the result of a business partnership with StanPro, a full scale provider of OE-style QD fittings. TechAFX will be showing their fuel, evaporative and coolant hose assemblies with QD fittings and PTFE hose for late model vehicles to improve underhood appearance and drivetrain performance. These assemblies are designed and manufactured to exceed production vehicle specifications, install easily and provide excellent reliability. In a world premiere, TechAFX is using SEMA 2010 to unveil their revolutionary AN fittings in -6, -8 and -10 sizes for PTFE (PolyTetraFluoroEthylene) braided steel hose. The black anodized TechAFX AN fittings have been designed in partnership with JDA to mate to large diameter, conductive Teflon hose: Teflon hose is impervious to gasoline, ethanol, methanol or just about any chemical. The future of hose assemblies will include PTFE hose because it does not swell and crack prematurely like CPE rubber braided steel hoses do when exposed to today’s fuels. TechAFX AN fittings for PTFE hose install easily with simple hand tools, come in a full compliment of sizes and angles and are Made in the USA. If you want to install hoses that will provide safe, durable and good looking service over the life of your vehicle, then TechAFX QD and AN fitting-equipped PTFE hoses are for you. Stop by the TechAFX booth #24791 or go to www.techafx.com for more information.